Gary Paffett completed his main objective in Santiago, Chile, this past weekend as he finished a full race distance for the first time this season and gathered more crucial data and experience for the season ahead. 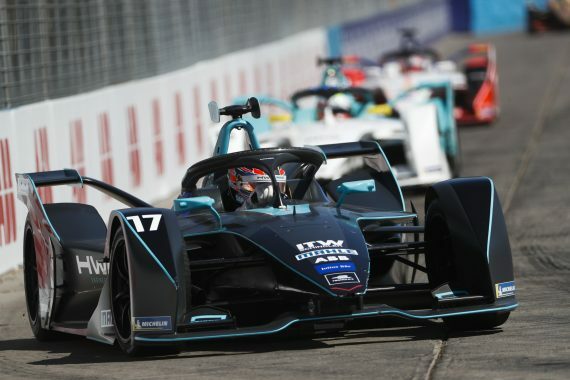 Gary’s third ABB FIA Formula E race weekend took him to South America as the all-electric series arrived at the Circuit Parque O’Higgins for the Santiago EPrix in Chile. With free practice commencing proceedings in Santiago, Gary recorded an impressive 27 laps in the 45-minute session to collect vital data for the day ahead – finishing the session in 15th place. Continuing to post the lap times in, in second practice Gary completed the sixth most laps of all the drivers as he extended his knowledge of the series and the Parque O’Higgins Circuit. Drawn into group four for qualifying, Gary was able to post his fastest lap time of the day, a 1:09.505, to qualify in 17th place for the Santiago EPrix. However, after Lucas Di Grassi was excluded from qualifying, Gary moved a spot up the order into 16th place. In the scorching Chilean heat, with the temperature outside of the car soaring as high as 37 degrees Celsius, Gary drove a mature race with the prime objective of finishing in the race in the back of his mind. Due to the extreme heat, intermittent technical issues plagued Gary’s race performance and his HWA RACELAB team were forced to change their race strategy to ensure Gary completed the full race distance and gain vital experience as the team continue their development in their first season in the series. Keeping his nose out of trouble and not taking any unnecessary risks, Gary brought the car home across the finishing line for the first time this season as he took the chequered flag from 14th place. Despite his struggles in the tough conditions, Gary was still pleased to have finished the race and knows the experience will make the team stronger. “It was a very tough race. At the start, we were able to match the pace of the others, but we then had to change our strategy due to the high temperatures. In the end, we were able to return to the standard settings and the pace was good again. We have to learn from situations like this, in order to keep the energy consistent in high temperatures. On the positive side, however, we did complete the full race and gained more experience. This entry was posted	on Tuesday, January 29th, 2019 at 9:00 am	and is filed under Featured, Motor Racing. You can follow any responses to this entry through the RSS 2.0 feed. Both comments and pings are currently closed.